This full size cello bow for sale was made in China by the Remy factory in 2011. The Jacques Remy has been producing fine bows for many years now. 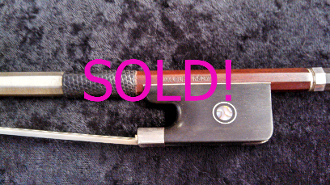 This Remy Cello Bow has a lovely octagonal pernambuco stick and an attractive silver mounting. The frog has a Parisian Pearl Eye. The balance of this bow is good and there is no hint of warping. It is brand new and has no blemishes. This bow draws a deep and rich sound out of any cello. Priced at $295.00, this bow is excellently suited to an aspiring cellist.